About PMKVY: Pradhan Mantri Kaushal Vikas Yojana (PMKVY) is the flagship outcome-based skill training scheme of the new Ministry of Skill Development & Entrepreneurship (MSDE). The objective of this skill certification and reward scheme is to enable and mobilize a large number of Indian youth to take up outcome based skill training and become employable and earn their livelihood. For more information, you may refer the official site by Clicking Here. AIMA CME is an authorized training provider of IT & ITeS Sector Skill Council (NASSCOM) and Retail Sector Skill Council (RASCI) to offer training for skill oriented courses across the country. The more training locations will be specified soon. What is the PMKVY scheme about? A trainee can fill the "Student Enrolment Form" available on this website. What are the charges/fees for the course? Trainee will need to pay for the training and assessment fees upfront to the Training Provider. The Training Partner can also provide credit to such candidates and waive off the course fee but still need to collect the Assessment fee. The Training Partner would then be paid from the monetary reward by the trainee after getting certified. What is the eligibility criteria for the trainee to enroll for a course? This scheme is available to any person of Indian nationality. Trainees who successfully complete the assessment receive the Certificate with a stamping of Govt. of India, associated SSC and training partner. 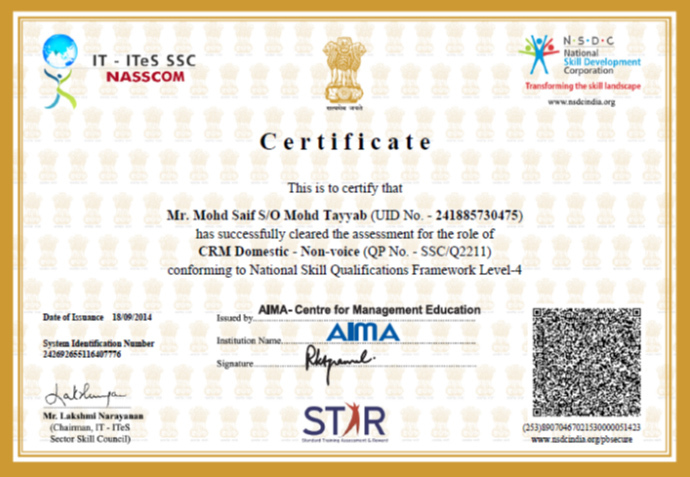 AIMA has participated in STAR Scheme under IT-ITeS Sector Skill Council (NASSCOM) and had been at No. 7 in the Training Partner Performance Analysis with a pass percentage of 71% which is self-explanatory about training delivery standards being followed by AIMA. AIMA has a systematic hierarchical framework to address the grievances* the individual may write to the official for the same. *With specified time limit given at each level.